Nice sighting and photo, booni! Spotted a youngster low down in The His & Hers Tree yesterday morning. They seemed to be watching something going on to the right. Booni have you seen any eagles that might be Dad? Or is it likely he left the area for some reason? I keep hoping we'll get a clean sighting. Thanks! nubchai, i am still looking for Dad. 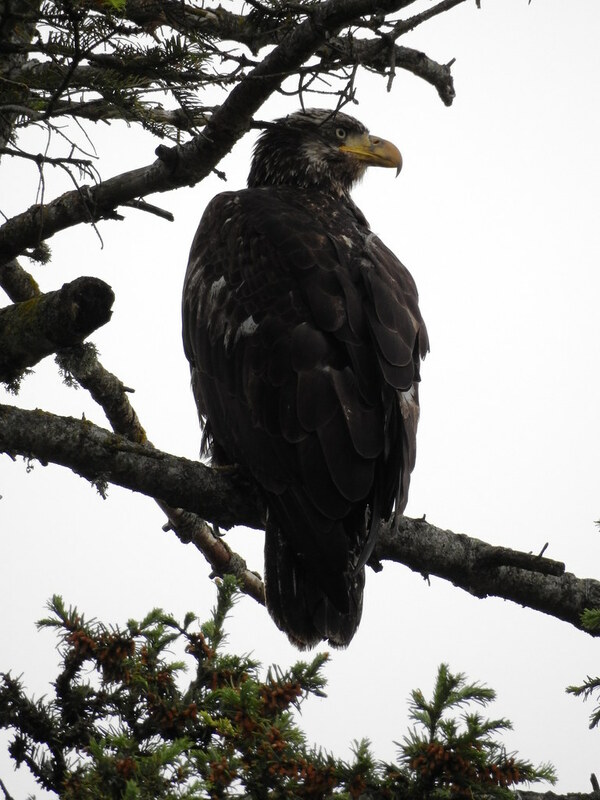 There were Eagles i was so sure were him, but i couldn*t say definitively because i never saw his distinctive feather. 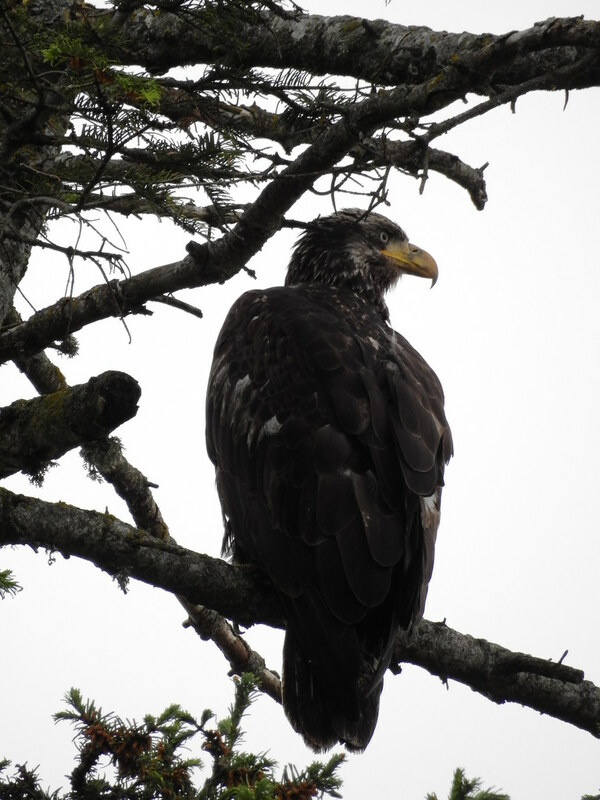 There is one Eagle i just photographed that matched an Eagle back in march who i was hoping was Dad. There still seem to be other Eagles vying for Em, so it has been very confusing. Thanks Booni. The part that I find confusing is that it looks like he left Em. I keep hoping he pops up Thanks again. I look forward to your photos and reports so much. nubchai, Dad looked like he*d been in a terrible fight, with terrible injury to his beak, just like Mum only Mum was way worse. We don*t know how the other Eagles came out of the fights, but we do know what happened to Mum & Dad. 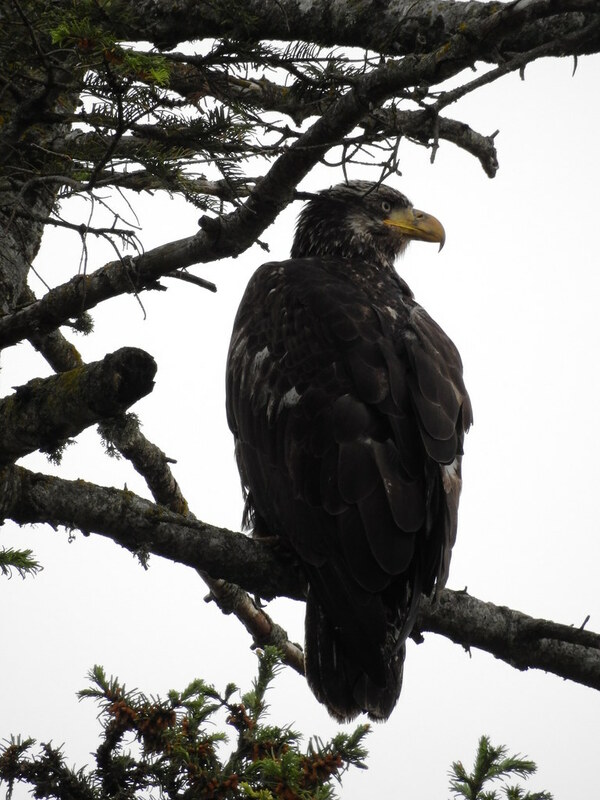 When there are other, probably younger, Eagles battling for your territory, & you come out injured like that, perhaps at some point Mum & Dad decided that they just weren*t going to come out well from such fights & they needed to step away. Maybe they*re not as young & strong as they were, or as strong as the Eagles they are battling. So do they keep battling for their territory & getting injured, or do they step away? So it isn*t necessarily that Dad left Em, it is possible he is waiting in the wings, but if there are other Eagles vying for Em & the territory still, then maybe it is in his best interest now to stay out of the way of fighting. Booni that makes perfect sense. I think both Mom and Dad were up in years. I vaguely remember Doug Carrick saying that and that was years ago. I thought Dad's beak injury look like it healed pretty well. But I wonder if both weren't stressed out enough to go elsewhere and avoid more fights. 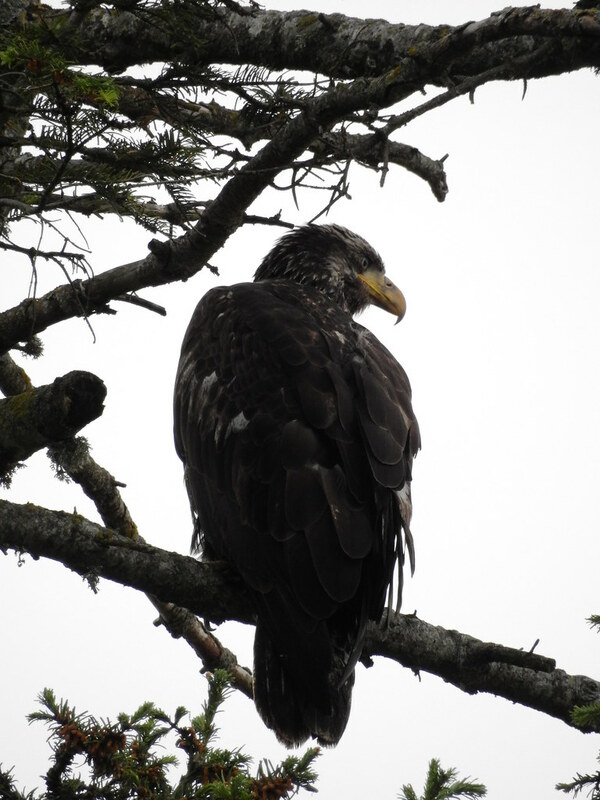 I remember Mom left when they had all of the young eagles and they had a sort of feeding frenzy in the water. So the young eagles were very aggressive and she got hurt. Years ago, I wished they had put those small transmitters on Mom and Dad, but there are so many problems with that not the least of which is catching the eagles. Thanx for all the updates and beautiful pics. I too remember Doug saying many years ago that he'd been observing mum and dad for over ten years, so I guessed they must have been a good age even then. Don't think dad was ever really the same after mum went missing that March. Ems is younger and may still take up with one of her suitors if dad fails to return. Wherever he is I hope the sun is on his face and the wind on his back. Will hope that he returns in October when his wounds have healed. Although I think he is better off away, as he is getting too old to fight for his territory. It is a nice rainy day & i am about to tuck into lunch & do a bit of my jigsaw puzzle before my meeting in half an hour when the phone rings. It is my friend who lives on the beach to the left of Grassy Point. She was the one who told me the fabulous story about the Eagle she saw in the water that she called me about, all worried, that turned out to be Dad swimming in with a big Fish in his feet! i assume she is calling to ask for a ride to the meeting, since it is pouring rain. She usually walks there, & the pouring rain doesn*t stop her. Turns out she is worried about a Canada Goose she has spotted on the beach right in front of her place. The Goose seems to have an injured wing. Sometimes i need time to think, & i don*t have time to think about this. i just started my fire & need to tend it to keep it going, i need to eat my lunch, & i need to be at this meeting in half an hour. i am not very good at *right now* things. i decide i had better stuff up the stove, stuff in my lunch, cover up the puzzle, & go to her place on the way to the meeting to do an assessment. i call MARS & get their answering machine which gives you the emergency cell # which i also call & get the answering machine. i leave a message to give them a heads up, as i may need someone to meet the transporter of the Goose somewhere on Vancouver Island, depending how it all works out. MARS never calls me back, which throws a bit of a spanner in the works. i head down to my friend*s place with my camera & she points out where the Goose is standing, on the conglomerate rock very close to the vegetation level. It is pouring rain & the Goose is just standing there. She says when she walks down there the Goose heads very quickly down to the water. At this point the tide is way out, & i do not want to scare the Goose, just get some observation fotos. i right away get into a fret about how we are going to catch this Goose in this situation, & then how the heck do we get them to MARS if we even manage to catch them. i take a few fotos then run off to my meeting, promising to return afterwards. You can see that the Goose*s left wing is drooping. Also notice the white down feathers on the lower & upper back. i just LOVE they eyes of this Goose. 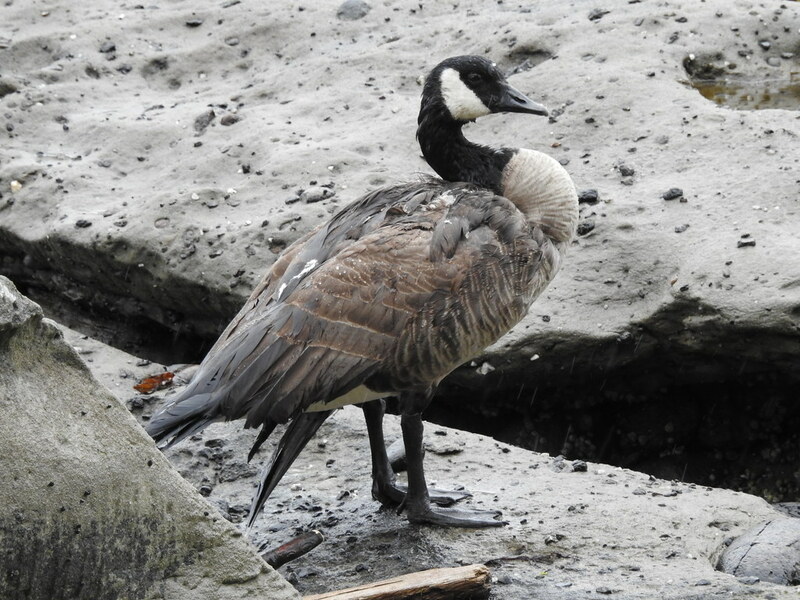 My friend is worried about a Turkey Vulture nabbing the vulnerable Goose, but i tell her they don*t so that. 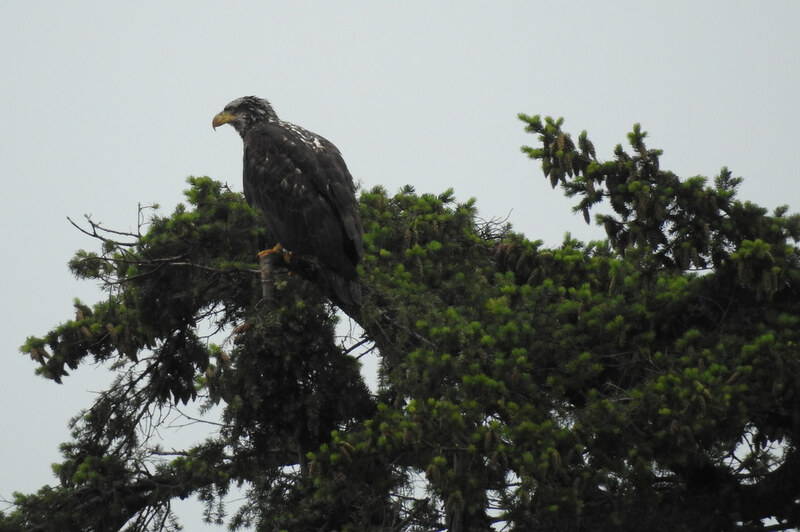 However, there IS an Eagle perched in the flat topped Tree to the left of Grassy Point, & THEY might. At this moment, however, they are more interested in the water. All through the meeting my mind is tick tick ticking about the Goose. i can just never imagine how a situation like this is going to work out well. My friend is a bit reluctant to intervene, it is raining, the beach is slippery with seaweed, last time i tried to catch a Goose i slipped & fell on rock like that & hurt my back fairly badly, the tide is coming in & the Goose will escape to water & we will have to try again, i don*t have a boat, & would that be safe anyway? Turns out the meeting finishes half an hour early! Yay, i get two takers! They are shore Bird counters, tall men, & perhaps a bit braver on the beach than i am going to be. i go home & prepare a large kennel with a towel in the bottom, a blanket to cover it over, two towels & a flannelette nightgown-lined net for capture attempt. You don*t want the nylon netting of a Fish net to damage the Bird*s feathers. i have been approached by the animal care manager at NIWRA. She needs a go-to person on Hornby, for Eagles or whoever, i said of course. i asked her about transport, that is always the problem from here, she says she has transport, so i am thinking about that. i get down there & lug the equipment down to the yard near the beach. They are already there discussing the situation. The worry is that the Goose will head to the water, & then what. The tide has come way in, unfortunately, & the Goose doesn*t have far to run to get there. i suggest the two fellas go wide, one to each side, head towards the water & then towards the Goose, so that they are between the Goose & the run to the water. One takes a towel & one the net. Try to get the Goose to run to shore where they will be hampered by grass & bushes, i say. Two more of us have towels & wait for the fellas to get into position. The Goose is not moving! Us other two with our towels start making our way down to the beach. Suddenly the Goose does a sideways dash, across the beach. One fella slips & is flat on his back. But he bounces back up & is after the Goose. Three of them get the Goose surrounded near the shore & the one who fell pops the net over the Goose! i come toddling up to the scene & there is the Goose under the material of the lined net. i reach through the material & have the Goose by the back of the head & i lift the edge of the net so that one of the fellas can cover the Goose with a towel. This happens quickly & nicely, & i be sure to cover the head with the towel. The fella bundles the towel around the Goose & i tuck in the injured wing for him. He is off with his bundle towards the kennel. He says the Goose is light, maybe only five pounds. He pops the bundle into the kennel & i draw out the capture towel. The poor Goose is done in & doesn*t move. i cover the kennel with the grey blanket. The fellas carry the kennel up to my van & of course Otto starts barking at them so they offer to take the kennel to my place in their truck! My friend says she can take the Goose to MARS in the morning! Could this turn out any better? At my place we settle the kennel onto my covered porch for the night. Then it turns out one of the fellas has an appointment in town tomorrow & they are offering to take the Goose right to MARS on the first ferry! They decide to come get the kennel in the morning & then realize they may as well take the kennel right now in the back of their car, safe for the night & ready to go in the morning. i call my friend to tell her the problem is solved then call MARS & someone answers, yay, so i tell them about the Goose on the way in the morning. That night i send directions to the two drivers & give them the heads up to check the Goose is even alive in the morning, the poor thing looked so done in i am greatly concerned. i get a call mid morning the next day. The Goose was alive in the morning but not alive once they arrived at Buckley Bay. They decide to leave the Goose on the beach after examining them & taking a foto. The Goose has been attacked by a large Dog, there are two big bite marks on the back near the neck, which is why there are all those down feathers there in my assessment foto. Oh Booni, so heartbreaking but thank you to you, your friend and the guys for all you tried to do for it. What a sad outcome.